It's a sad day for numbers. 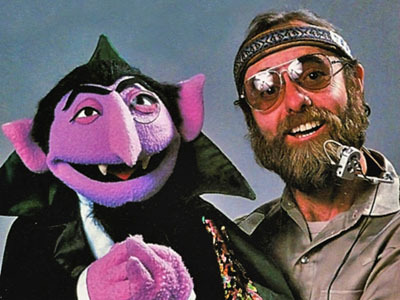 Jerry Nelson, the puppeteer known for playing the instructional Count von Count on Sesame Street, died Thursday of unspecified causes, according to CBC Radio-Canada. He was 78. Besides the non-threatening vampire, Nelson, a Tulsa native who grew up in Washington, D.C., also performed Gobo Fraggle on Fraggle Rock and The Muppet Show's Sgt. Floyd Pepper of the Electric Mayhem band; "Pigs in Space" stalwart Dr. Julius Strangepork; Kermit the Frog's nephew Robin; and Gonzo's girlfriend Camilla the Chicken, among other roles, says the site. He first trained with American puppeteer Bil Baird, who was responsible for the lively "Lonely Goatherd" marionette sequence in the 1965 movie blockbuster The Sound of Music, starring Julie Andrews. That same year, Nelson worked with Muppet creator Jim Henson on TV's The Jimmy Dean Show, a variety program on which Kermit and the gang first became popular with American audiences. Nelson's Sesame Street stint began in the '70s, and he continued to be the Count until his retirement in 2004. Peace Jerry, you old hippie.